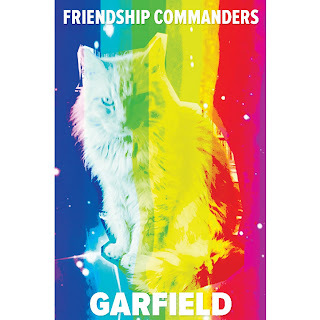 Friendship Commanders: THE NEW EP IS OUT TODAY! THE NEW EP IS OUT TODAY! The GARFIELD EP is here! We're so happy to be able to share this body of work with you all. Digital and analog copies can be bought here! As we said before, one dollar of every EP sold will be donated to animal rescue efforts in memory of the late, great Garfield Candy-Goodman. Lyrics can be read here. Thanks to the Nashville Cream and We Own This Town for previewing and reviewing the third track, "Jean Dark." Our release show is tonight at the Stone Fox in Nashville. We'll be joined by local bands Shadraq and Desmond (new project by Duane Denison and Paul Allen). Here's a write-up that the Nashville Scene did about it! We'll be over at Grimey's Too for an earlier in-store set today at noon. The Halloween single will be released on October 30th, just in time for the best holiday of the year! In the meantime, check out the Halloween singles we've released so far: "Pet Sematary" (2013) and "Them Bones" (2014). All proceeds go to addiction research! Thanks for your continued support. Don't forget to support your independent music stores, too. Grimey's, Fond Object, and The Groove all have our new tape, plus tons of other rad music. Happy Cassette Store Day!